The New London Market on the Green, where for the past two summers we’ve been selling notecards and prints made from my blog drawings, is coming back as the Winter Market. It starts this coming Saturday, January 26th, and continues on the fourth Saturday of each month through April. It will be held from 10 to 2 in Whipple Town Hall, at the intersection of Main Street and Seamans Road. 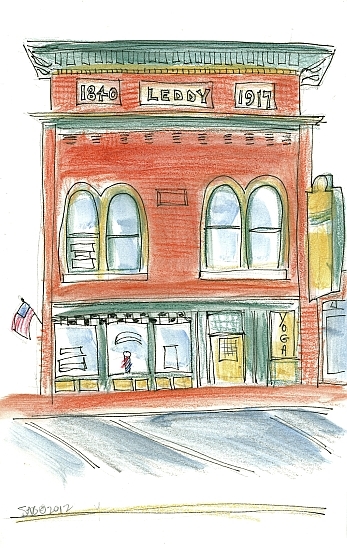 That’s the red brick building just to the right of center in the drawing below. I’ll have a full assortment of my work on display, including some with a special winter theme. Stop by! I’d love to see you. Here are a couple of New London winter images, one new and one a repeat from last year, to set the mood. The little skating rink on the Green is busy whenever the weather is cold enough. 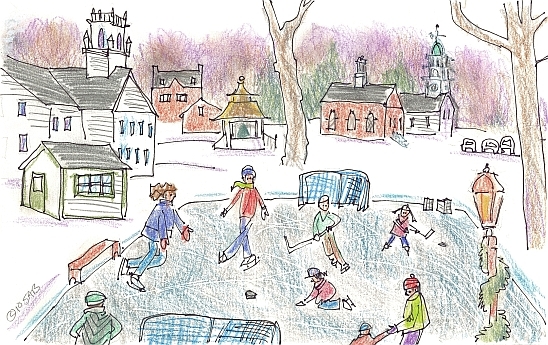 The rink thawed last week, but the ice has returned this week. There is no town Zamboni though. 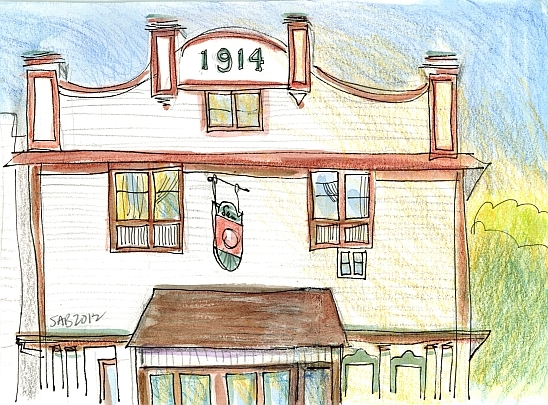 I drew this from inside the warm New London Inn. Pleasant Lake has frozen and is covered with a layer of snow. In the foreground the berry-laden winter vines brighten the scene. The dark treeline at the far end of the lake is the village of Elkins, where we pick up our mail. 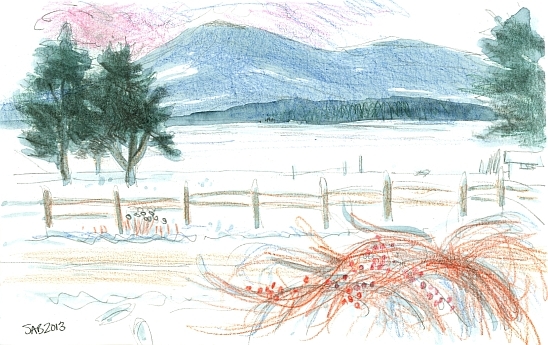 My first three drawings have a theme of winter openness. The next ones revolve around the concept of shelter. The town of Warner, New Hampshire is very close to our town of New London. Up to now, I had only drawn their very handsome library. So before a grocery shopping trip, I took the time to draw this snowy intersection of School Street and Main Street. In the winter time, when the leaves are off the deciduous trees, the underlying forms reveal themselves. Some trees have had an easy life, and some are broken and misshapen by wind and ice storms. The house on the far left with the overhanging upper story is unusual, to the point of being odd. The person walking down the hill, in her blue parka with distinctive red stripe, is choosing to navigate the well sanded road rather than the icy walkway or sidewalk as we say in North America. We lived in Maryland for a long time, and we occasionally return for a short stay. 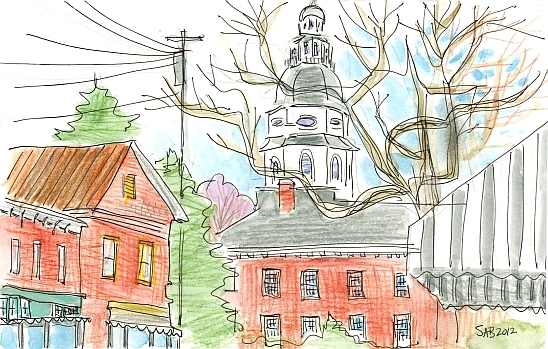 Annapolis is the state capital, and was for a short time the capital of the brand new country of the United States. The State House, as this building is called, sits in a circle of parkland. Cobblestoned streets radiate from it, like the cliched spokes in a wheel. This is a view from Maryland Avenue, a charming little street to the east that I didn’t know about for years. Charming boutiques, galleries, and bookstores line the narrow street. Drawing in the winter is enjoyable because I am able to see through the trees. (Yes, that particular tree is unusually angular, but full of character.) Vistas and angles impossible to see during the leafy season just pop out. The State House building is of enormous proportions, and I can think of no view where a person can actually take in all of it. But with the bare branches, it is possible to glimpse more of it. The flagpole atop the spire didn’t fit onto my page. The Maryland state flag is devilishly difficult to draw anyway. 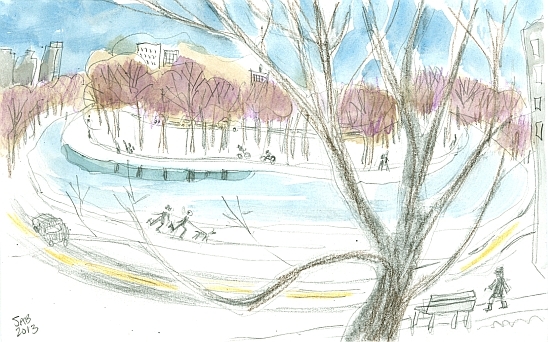 I sketched the view from our window in the Riverbend BandB in Cambridge, Massachusetts last weekend. The Charles River makes a very sharp u-bend here. There’s a lot of ice and snow on the river, and one open patch reflecting the tree trunks. There are roads on both sides, as well as pathways and sidewalks. Which means cars, joggers, dogs, bicycles, walkers and all sorts of traffic to be sketched. And it can all be seen and observed because the leaves are off the trees. Yay for winter. Across the river is the city of Boston. The buildings on the far left are indeed on the Boston side of the river, around another sharp bend. On this side of the river are Harvard and the Massachusetts Institute of Technology (MIT). I get a chuckle (to myself) when people tell me that they can only draw stick figures. They're telling me that they have no talent for art. My joggers are stick figures, and the close by walker has boots, coat and hat drawn on top of her stick figure body. And now, for three drawings of precious objects, protected by small roofs. 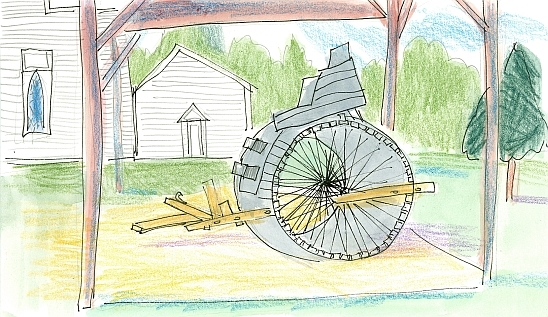 This snow roller sits on the town green in Pittsburg, NH. (There is no ‘h’ at the end of the word.) This town, named for a British Prime Minister William Pitt, is small in population but large in square miles. Largest in the state. 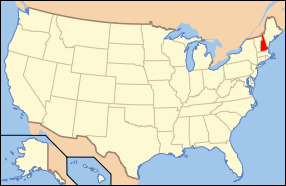 On the border with Canada, Pittsburg was known as the Republic of Indian Stream for a few decades in the 19th century while the governments of both the United States and Great Britain claimed it. The confusion seems to do with badly written treaties and disagreements of the location of the head waters of the Connecticut River. The townspeople objected to being taxed twice, so they formed their own country. It had a government and a constitution. It is not the first snow roller I have ever seen, but the first sitting on the town common with a little roof sheltering it from the elements. Constructed of wood and wire, it looks like a possibly dangerous device to harness behind a horse. During the winters here in New England (and elsewhere I assume) the heavy snow was rolled flat. This made transportation for the horses, sleds, and carts better. Winter time was considered the easiest time of year for traveling. And the best time for other things, like moving buildings. Inhabitants enjoyed traveling directly across the frozen lakes too, as it saved a lot of miles. And now, an object under a small roof, number two. On a crisp autumn day, we stopped at the Newfields NH Memorial Park. Here we see a Revere Bell displayed on Main Street under a shingled sheltering roof. The bell hung in the Methodist Episcopal Church from 1836–1923. It was given to the town in 1975. There is a crack in the bell, probably from the fire in the church. 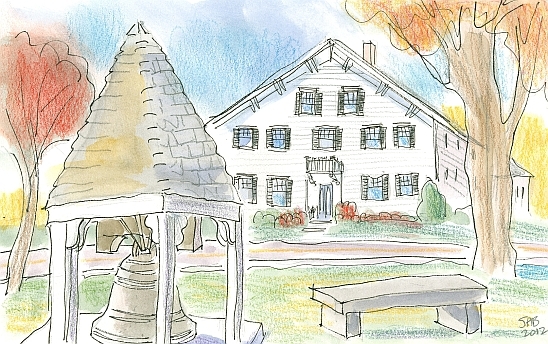 In New England, Revere Bells are revered. They truly were manufactured by the patriot Paul Revere in his metalworks. The house across the street is unusually wide, a sign of wealth. It is painted wood clapboards. This is my third drawing of a precious roofed object. It was just waiting to escape from my box of drawings. I drew it in the fall, at a rest area along Route 99 in Washington state. On the west coast of the US. 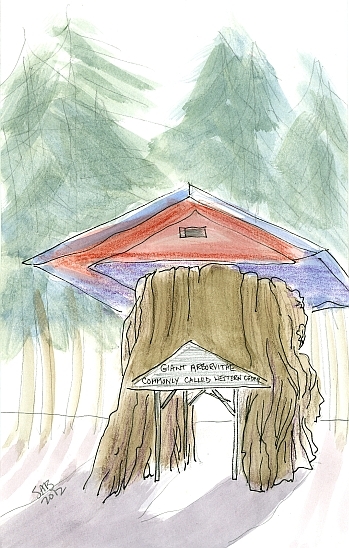 It is a very big and old cedar tree, now with a sign, a drive-through passage and a colorful hat. The sign says ‘Giant Arborvitae, commonly called Western Cedar.’ A smaller sign told the facts: this tree is a thousand years old, and it is 20 feet across. And furthermore, it was killed by a fire, moved, fell apart, reassembled and brought to this spot in 1971. I have never seen anything like any of these three roofed objects. And now to continue with the theme of shelter. We were in Boston, Massachusetts last weekend. We decided to visit the Isabella Stewart Gardner Museum in the Back Bay section of the city. The privately owned and run museum was originally named by the founder as Fenway Court. The three story brick museum was built in 1903 to house the enormous art collection of Isabella Stewart Gardner (1840-1924). 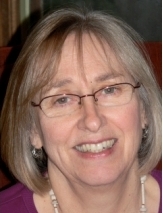 She spent two years overseeing the design and construction of the building and the installation of her collection. There is not a major artist she has missed. Rembrandt, Botticelli, Vermeer, Degas, and even a John Singer Sargent full length portrait of herself. You feel as if you are walking through a private residence, as she also collected furniture, textiles, urns, and marble fireplaces. The lights are low, and there are no signs or labels. Helpful historical information is printed on loose sheets of paper ready to be picked up and carried around by the visitor. We didn’t, preferring to absorb the ambiance without the aid of words. 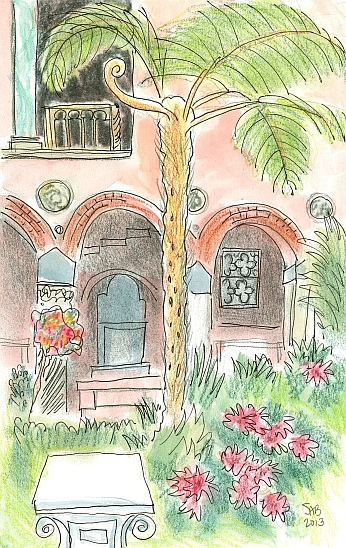 It was my intention at the start of the day to drew the 15th century Venetian inspired courtyard. Which I did, with more than the usual amount of artistic struggle. But now that the composition has been resolved, it all looks effortless, right? To be clear, all the columns actually are different one from another, as are all the rondels. It was a respite on a cold winter day to see the fuzzy palm and the lush foliage and blooms. A glass roof, installed from the beginning in 1903, encloses the courtyard from the weather. Besides Venetian courtyards, one can always find winter refuge in the local library. This unusual one is in Stratford, NH. 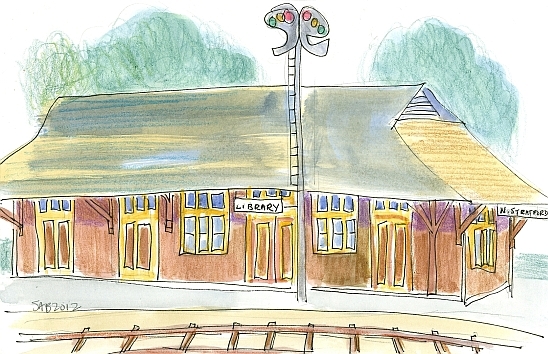 It is, of course, a repurposed rail road station. It was not open the day we were roaming around this small town, located on the Vermont border. It is indeed named for the slightly more well known town of Stratford-upon-Avon. The population count of the town is under a thousand. And as another variation on the theme of shelter and repurposed New Hampshire railroad stations, this building is the Gorham, NH railroad museum. Gorham is an old resort town in the White Mountain Range. 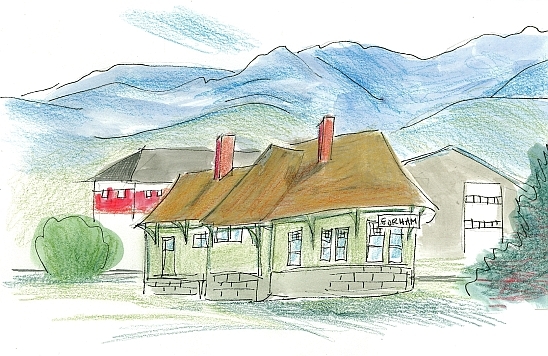 When I drew this, the the mountains were quite blue with summer’s heat haze. I included the two very modern buildings behind the grey stone and green painted wooden museum edifice. When the roads are clear, recently sanded and no white precipitate falling from the skies, one can crave entertainment in the long winter. 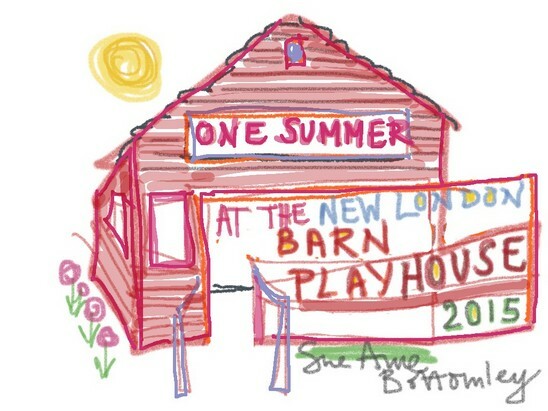 Above is a drawing of the home of the Pittsfield Players, in Pittsfield, New Hampshire. When it was built, it was the place to go to see a silent film, then a talkie. In North American, we generally call them movies now, whereas elsewhere they are called films or cinema. Another choice for indoor winter entertainment is the Leddy Center for the Performing Arts in Epping, New Hampshire. In the same building are a barber shop and a yoga studio. 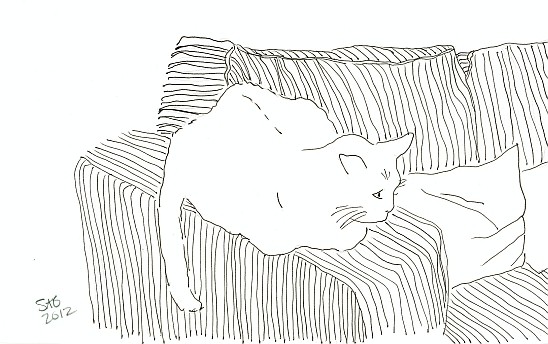 Lastly, on a frigid winter’s night, stay home and snuggle up with your cat. Today my DRAW-NH! project and my blog too are featured in a full page spread in the New Hampshire Union Leader newspaper. Thanks very much to the writer Melanie Plenda for her interest in my art. It’s beginning to look as if the article isn't going to appear on the Union Leader’s website. So I’ve posted a scan at this location. Having started out from a newspaper it is kind of fuzzy, but I think it will still be legible enough to read. 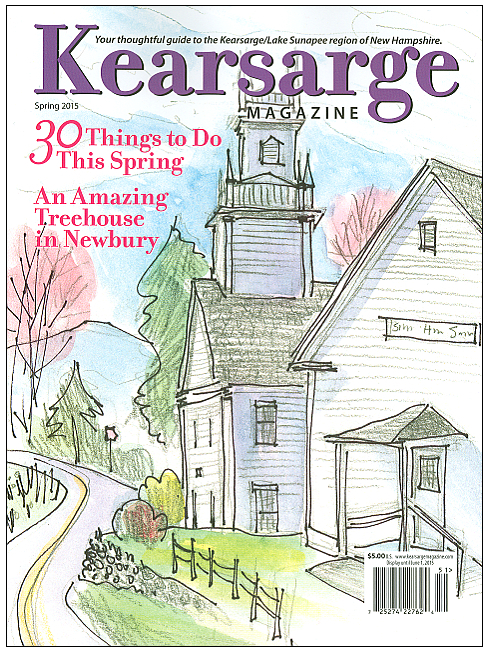 One of my drawings, New London’s Tracy Memorial Library, was included in the article. 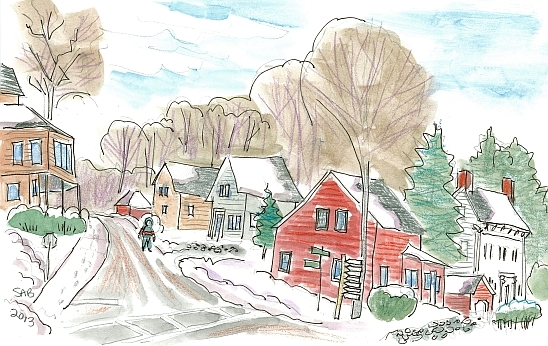 I have now been to all 234 of New Hampshire’s towns and cities and drawn an image in each. But we have only had the time and opportunity to post about two thirds of them online. The next 80 or so towns will appear in monthly installments over the next year. When I am finished with a drawing, I store it in a box. 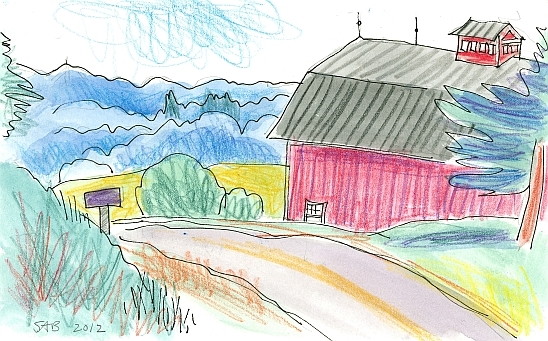 Each month I pull out ten or so drawings from New Hampshire, and elsewhere in the world, that seem to me to tell a story. I look for a narrative that links images. This month’s blog, as yet unfinished, has a theme of winter. And the feelings of openness of the landscape as well as the desire for shelter. Below are images of the towns of Monroe and Lyman, NH. I spoke of them in the article. Since neither of them had been on the blog as yet, I thought I should post them today. I wouldn’t want to disappoint a reader. 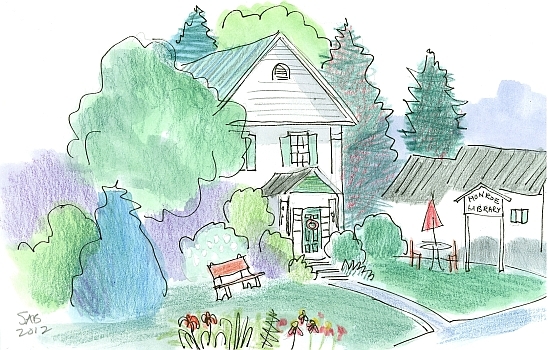 Summer sunshine, a quiet triangular town green, and lush foliage. 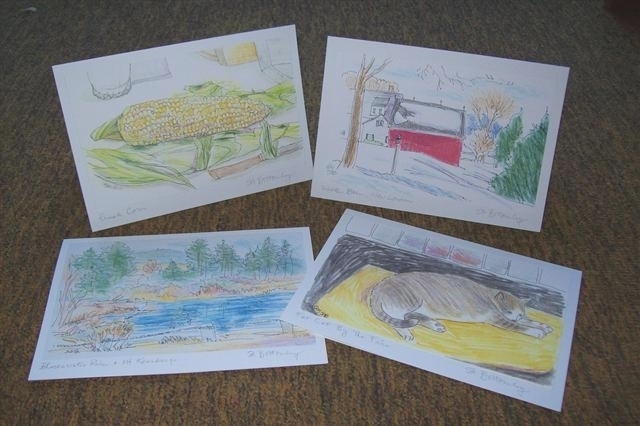 These memories return to me when I remember my sketching time in Monroe, NH. The library is in an old dignified home. The library sign out front is much more charming than I’ve shown here. It has two profiles of little children reading. They just didn’t fit into my small scale drawing. Monroe is on the Connecticut River, bordering Vermont. It was originally, in 1762, a part of Lyman. Despite or because of our atlas, we decided to take a short cut to the next town of Lyman. For a very few extra miles, we could have stayed on the highway. But we choose to take the direct route over the hills (or are they mountains?). I can’t say how long a road it was, or how many miles we saved.The very deep ruts were caused by water runoff over the decades. The glacial boulders remained in place. I do clearly remember my husband saying that my screams were distracting him. So I shut my eyes as we bumped and lurched along the logging road, screaming inwardly. That took all my concentration. I do believe that there is a cautionary sign at the start of the passage proclaiming it to be an ‘unmaintained road’. A warning to the wise is sufficient, they say. Well, clearly we made it. I was sooo happy, giddy maybe, to reach the other side. To see the town line sign of Lyman. This is why the people of Monroe decided in 1854 to break away from Lyman and form their own town. I am fond of curves in a road, barns, and blue mountains. I yelled ‘stop’ when we topped this hill. I intentionally made the drawing’s lines and colors extra lively and joyful.